First, we create chef-inspired, preservative-free, original bases from the freshest ingredients. Second, we pour the base into our proprietary MISTIFY® liquid nitrogen system, mixing and freezing the base at -321 degrees Fahrenheit. Third, we are left with a creamy and smooth frozen batch of ice cream or cocktails that through the instant freezing process brings flavors to life in a way no other process can, as well as freezes guests’ attention to watch the live and fascinating experience. 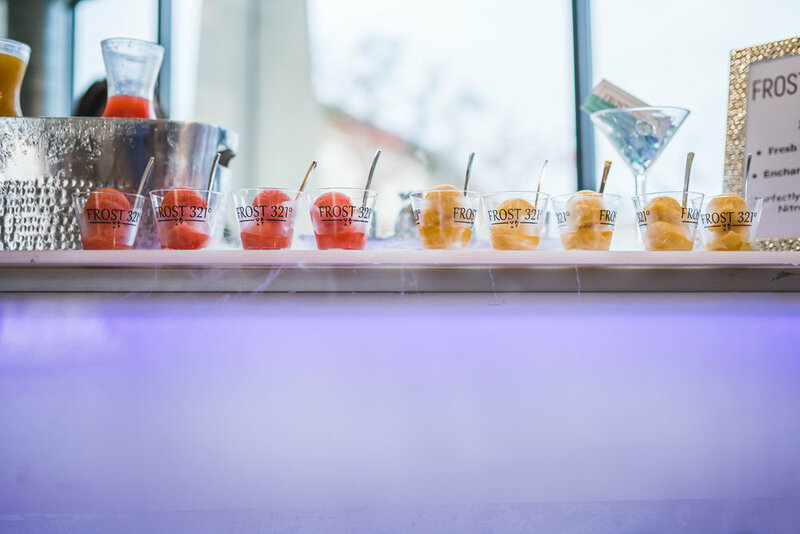 The ultimate ice breaker at events, guests have the option to enjoy a buzz-worthy frozen cocktail or alcohol-free ice cream or sorbet. Fashionably dress up the frozen treats in less than two minutes with anything from whiskey or tequila to butter pecans or red velvet cupcakes. When the liquid nitrogen has safely misted away, the dessert or cocktail can be accessorized further and served at a palatable temperature that is safe for consumption. Frost 321 desserts and cocktails are best served at corporate events, social events, weddings, and high-profile large events, as a niche, on-site catering service. Elevate your events through our franchising opportunities! Frost 321 is ideal for entrepreneurs with sales and marketing, food and beverage, or event experience. Increase event bookings by capitalizing on your community industry connections through your event company or offer as an add-on generating additional revenue for your restaurant’s offerings. Frost 321 is scalable to meet the needs of any event, any size. We set franchise partners up for success through our comprehensive operational and sales training before, during, and after you open your business where you will be up and running your own events in just a few weeks. We also offer marketing support sharing press release templates, national advertising/promotions, social media, local marking tools, community involvement programs, and more. For more information, email us at franchise@frost321.com or call (888) 640.1321.